Here’s the deal: We’re fishing the Upper Chesapeake Bay in the early winter. It’s tidal, a cold front has blown through, the water’s cold and it’s more stained than usual. Our mission is to find and catch bass on film. they were in shallow water. We used a combination of Silver Buddy and Molix Trago blade baits. They’re pretty much the same except for a few refinements on the Trago. Silver Buddys are simple. They’re stamped out of metal, have a lead back and a couple of treble hooks. They come in two colors — silver and gold. 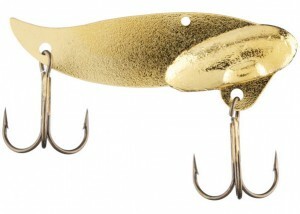 The Trago has a variety of finishes, a head that actually looks like a head and double hooks instead of trebles. That’s more important than you might first think. 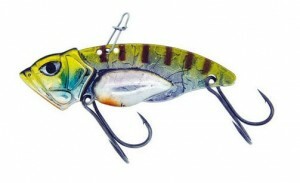 Blade baits are notorious for hanging on everything and anything in the water. At best that causes lost fishing time. At worst it gets to be darn expensive. When we fished with the Silver Buddys we clipped the forward looking point off the hooks. We didn’t notice any difference in hooking percentage using two point hooks instead of three point hooks. Our color choices were simple— gold, or gold, or sometimes we used gold. The prevailing forage is yellow perch from 1 to 2 inches long. Is there a better match than a gold Silver Buddy or a gold Molix Trago? We used 7-foot, medium action Abu Garcia Veritas rods. You don’t need a long rod when you’re making short casts that aren’t much farther than a pitch. Our reels were 7.1:1 Abu Garcia models and we spooled them with 15-pound-test Berkley Trilene 100% Fluorocarbon. Our approach was simple and direct. We made short casts, right up against the hard cover. We’d let our lures fall to the bottom and then jerk them up just a little ways. Most of our casts were less than 15 feet and we only snapped the bait up a couple of inches off the bottom. Basically, we stopped as soon as we felt it vibrate so that it could fall back down. All you have to do is watch the film to see that blade baits are as good in shallow water as they are in deep water. That’s not an opinion or a theory. It’s a fact. Bass are predators, guys. Throw what looks like something they want to eat and that attracts their attention. DO NOT get stuck in stereotypes, old ideas or things that “everybody” knows. If you do, you’ll be sorry.